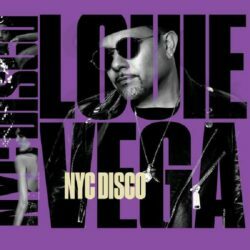 Grammy award winner Louie Vega is known worldwide as one of the finest creators and purveyors of house music, both as an individual artist / producer / DJ. He is back with a new album for Nervous records ‘NYC Disco. Louie was always aware of the many disco hits that had been released by Sam Weiss on his Sam Records label back in the 70’s and 80’s. But it was not until recently that Louie suggested Michael Weiss send him the 24 inch multi -track masters of seminal Sam Records disco classics like Gary’s Gang ‘Keep On Dancing’, John Davis & The Monster Orchestra ‘I Can’t Stop’, Convertion ‘Let’s Do It’, Vicky D ‘This Beat Is Mine’ as well as several others. That response, and the common drive that Louie and Michael both share to constantly promote quality music that is both song and rhythm based, inspired them to take this endeavour a step further, and to create brand new songs. When Louie’s creative energies start flowing, his team knows to rise to the occasion. The result is NYC Disco, an album that represents the full range of disco. As always with Louie the album features a star studded cast: Luther Vandross, Patrick Adams, Rochelle Fleming, Barbara Tucker, Be Be Winans, Josh Milan, Cindy Mizelle, Sharon Bryant, Anane and The Martinez Brothers. Standout tracks, well I could list them all but here’s just a few. ‘He Promised Me’, ‘Get Myself Together’, ‘Get With The Funk’, ‘ Love Fantasy’, and ‘Cosmic Disco’. Don’t miss this one!